The lobbying arm of some of the biggest names in franchising has become the face of an ongoing labor policy debate in Washington over joint employership. The group is focusing on what it says is the main risk to small businesses. From McDonald’s to Microsoft, a wide range of companies are fighting the National Labor Relations Board’s decision to make it easier for businesses affiliated through staffing and other contractual relationships to be found liable for each other’s workers. But whether it’s lobbying on Capitol Hill to undo the decision or pushing the now Republican-controlled NLRB to reconsider it, the International Franchise Association has been at the front of the pack, shaping the move as an attack on modern “mom and pop” shops. The NLRB in 2015 ruled that a company may be considered a joint employer of another business’s workers if it exerts even indirect control over them. That means more than one company could be forced to collectively bargain with those workers and may be on the hook for unfair labor practices under federal law, not to mention workplace safety and pay disputes if the ruling is adopted elsewhere. The 14,000 member IFA represents both franchisers—like McDonald’s, Domino’s, Dunkin’ Donuts, Supercuts, Hilton, and Choice Hotels—and franchisee operators. Two of the companies— McDonald’s and Domino’s—have been the subject of high-profile joint employer lawsuits since the board’s decision. 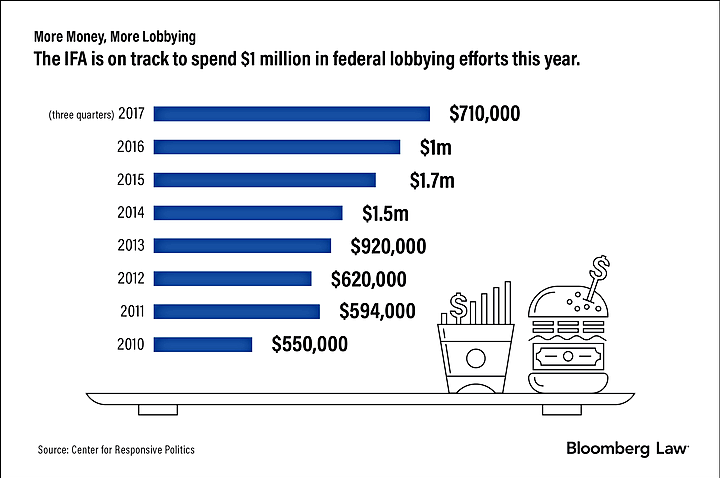 The IFA spent at least $1 million a year on federal lobbying from 2014 to 2016 and is on track to do the same this year. The advocacy group first made a name for itself by lobbying against Obamacare and food menu requirements for franchise businesses. It has shifted in recent years, through individual lobbying and in concert with the related Coalition to Save Local Business, to focus on the joint employer impact on smaller franchisers and independently owned franchise operators. The business model could be turned on its head by forcing franchisers to take a much more active role in day-to-day operations if the decision stands, according to the IFA. “I think it’s a great example of an industry that is being challenged at its core and where an association recognized the threat and got involved in an area that it was not involved in,” Michael Lotito, a management-side attorney at Littler Mendelson told Bloomberg Law. Lotito represents the IFA and the firm has done some lobbying work for the group. Critics say the group is doing the bidding of big franchisers, staffing firms, and other large businesses that use a maze of contractual relationships to exert control over workers while avoiding any responsibility to them. One point both sides agree on is that expanded joint employer liability may make it easier for unions to organize workers in fast food and other industries by forcing bigger players to come to the bargaining table. The IFA and other business groups have been sounding the alarm on the joint employment question since at least April 2014. That’s when the NLRB agreed to consider whether workers at the Newby Island Recyclery were employees of Browning-Ferris, the company that owned the plant, as well as Leadpoint, the staffing firm that hired them. But it was then-NLRB General Counsel Richard Griffin’s decision to permit unfair labor practice complaints against McDonald’s later the same year that really got their attention. That prompted a Wall Street Journal op-ed from Andrew Puzder, then CEO of the company that owns Hardee’s and Carl’s Jr. and a member of IFA’s board. Puzder was later tapped by President Donald Trump to run the Labor Department, but withdrew from consideration before a Senate confirmation hearing in response to Republican concerns and personal controversy. Griffin authorized 43 total unfair labor practice complaints against McDonald’s, including several alleging that the company punished franchisee workers for participating in a wave of protests aimed at fast food employers beginning in 2012. Many of those protests were staged by Fight for 15, a workers rights group affiliated with the Service Employees International Union. Fight for 15 has led millions of workers in walking off their jobs to urge businesses to raise wages for fast food workers and call for union representation. The NLRB said when the complaints were issued that McDonald’s uses “tools, resources and technology” to wield “sufficient control over its franchisees’ operations, beyond protection of the brand” for joint employment liability purposes. Representatives for the SEIU and Fight for 15 didn’t respond to multiple requests for comment. In much of its efforts since the McDonald’s complaints were filed, the IFA and its partners have pushed the joint employer issue as a specific threat to small businesses. That includes by having smaller franchise operators flood the Capitol during legislative action days and tapping the owners of a gourmet hot dog stand in New Orleans and a Knoxville, Tenn., gym chain to testify at congressional hearings. 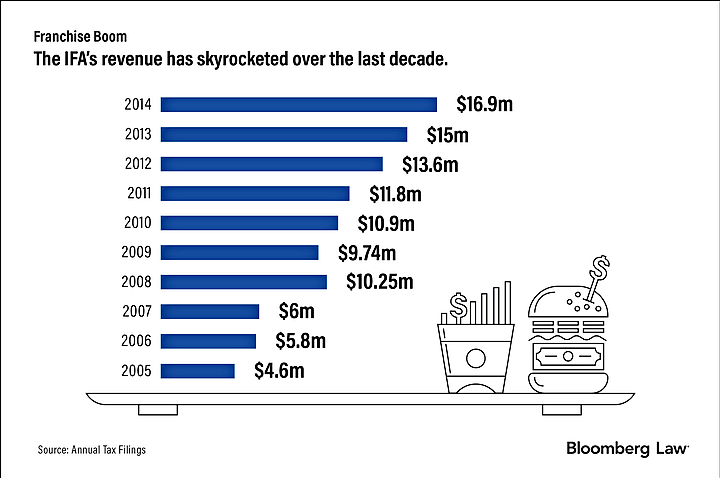 Haller said that’s because larger businesses like McDonald’s and YUM! Brands can afford their own lobbyists, but many other IFA members can’t. About half of IFA franchisee members operate five locations or fewer and 80 percent of franchiser members have under 500 locations, according to Haller. The McDonald’s cases are still being litigated, but new NLRB General Counsel Peter Robb (R) has signaled that he wants to take a closer look at the joint employer issue. The board—which will revert to a 2-2 partisan split when Chairman Philip Miscimarra’s (R) term expires Dec. 16—may very well revisit the question once it regains a Republican majority in the coming months. Meanwhile, an appeals court could rule on a challenge to the Browning-Ferris decision any day now. The Supreme Court may decide early next year whether to take up a separate federal appeals court decision finding that DirecTV is a joint employer of satellite technicians who said they didn’t get paid overtime. The IFA’s end goal is legislation tightening up the situations in which businesses can be considered joint employers under various federal laws, regardless of how those cases eventually shake out. Although the House passed the measure earlier this year, the bill is considered a long shot in the Senate. The group plans to continue the lobbying and marketing efforts until the law is changed. “We think we have a great story to tell and one that’s resonating,” Haller said.